Flinkenberg has served industrial and commercial sectors in Finland with its technical know-how since 1921. Oy Flinkenberg Ab was established in Helsinki, Finland in 1921. Since then has the family owned company served industrial and commercial sectors in Finland with its technical know-how. In the beginning the business was primarily based on the founder’s, John R. Flinkenberg’s, personal long-term international relationships which he had gained as a language-skilled person and an Olympic-level sailor. Core business focused on exporting and importing products that were needed in Finland such as agricultural equipment, textile, food and steel. In the 1960’s with Johan von Fieandt as Managing Director, the company started to distribute industrial products for Finnish industry. Especially the electronic industry took giant leaps forward as new business opportunities opened up. The company facilities were placed in central Helsinki until 1992 when Flinkenberg moved to its current location in Espoo. The new headquarters included administration as well as sales and stockholding of electronic components, batteries, industrial chemicals and abrasives. The third-generation CEO Bernt Ehrnrooth had a vision of the necessity of further processing products. The service and maintenance of batteries took the first steps. At the same time the company also invested in steel business by starting with reinforcing steel in 1994. A cutting and bending plant in Kerava was built next year. The steel plate business started in 1996 and continued by acquiring a small service center in Tampere. The new and modern Steel Service Center has operated since 2007 in Valkeakoski. Christoffer Ehrnrooth, one of the fourth generation owners, took place as Business Development Director in 2015 and was nominated as Managing Director later in 2017. Bernt Ehrnrooth was elected as Chairman of the Board. The same year Wilhelm Ehrnrooth started as Business Controller. ”I am extremely pleased that Christoffer is willing to continue his career in our family business and is ready to take more responsibility. I am glad to hand over the position as Managing Director to my oldest son. It is great to notice that throughout the company’s existence – almost a hundred years – there has been a family member managing Flinkenberg and this tradition continues”, Bernt Ehrnrooth explains. ”It was an interesting period to explore the wide range of our operations. Now it is the time to take more responsibility. Through the history, Flinkenberg has been run well and our operating conditions are excellent for the future. I am highly committed to develop our family business during its second century of operation together with our skilled personnel” Christoffer Ehrnrooth continues. Between the years 1960-1996 Flinkenberg owned half of the successful Oy Suomen Tyrolit Ab, which was the leading supplier of abrasives in Finland. Nowadays Flinkenberg is a shareholder in Oy Pureva Ab. Flinkenberg owns 40% of Schmolz+Bickenbach Oy (part of the German Schmolz+Bickenbach Group) which was found in 2006. In addition Flinkenberg has shares in the solar-power company GreenEnergy Finland Oy. Almost 100 years has passed since the establishment of Oy Flinkenberg Ab. 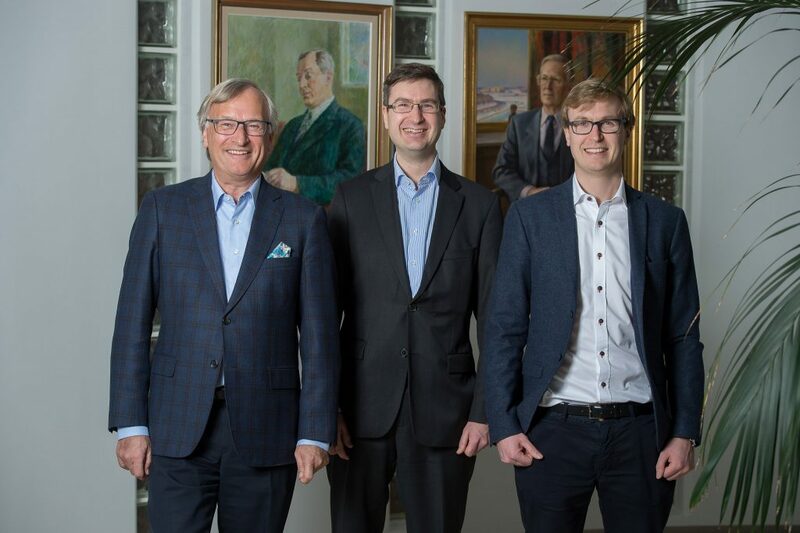 While approaching this rare milestone for a Finnish family owned business, we all look forward with great confidence to the new era in our company’s history.